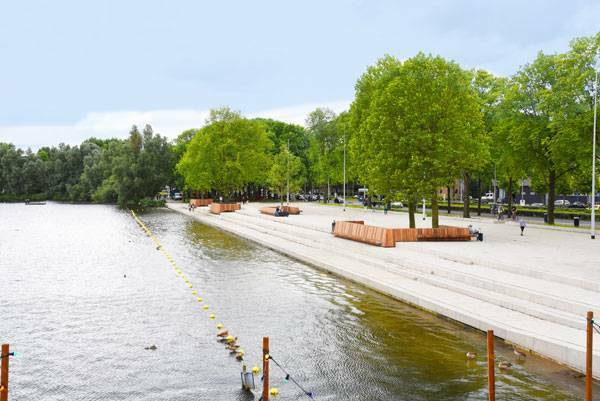 Article by Eleni Tsirintani – Zuidwestoever, by Guido Hermans: Stadsruimte, in Amsterdam, the Netherlands There are many ways to intervene into the landscape. 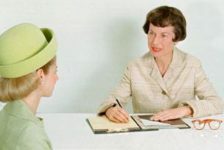 It can be modified, reconstructed, handled, or simply maintained. The latter is also an intervention. 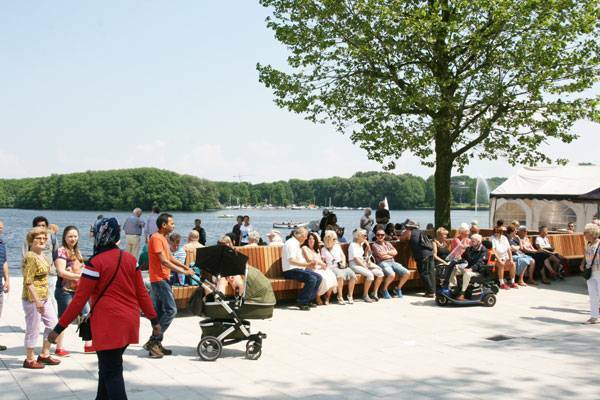 Zuidwestoever design introduces all of the above in a single design gesture to create a new place for the citizens of Amsterdam where they can walk, sit, organize events or simply be next to the water. 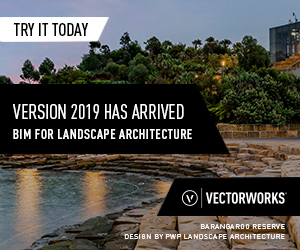 A new arrangement along the lakeside redefines the interaction with water, facilitates a number of new activities, and allows the citizens to enjoy a contemporary and high-quality public space. 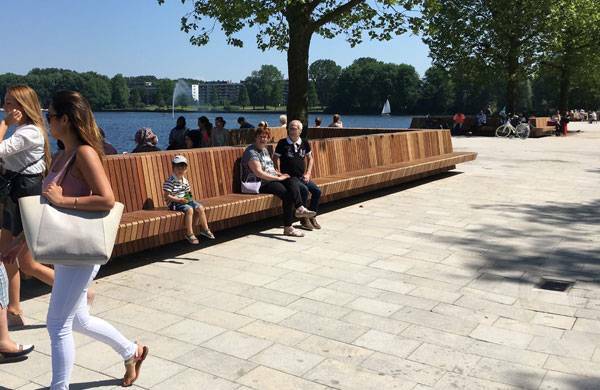 A set of linear wooden benches, specially designed and constructed for the site, articulate the new plan. 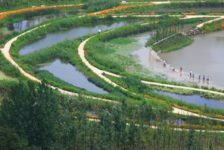 Lines that bend, fold or unravel along the lake materialize the project. The new geometry unfolds around and in interaction with large trees already found on-site. 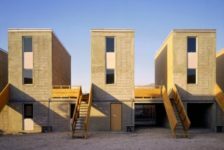 The design works with both new and existing elements to reach a coherent result. The intervention unravels along the edge of Sloterplas Lake. It is a linear boulevard; part of the Slotersplas Park facilities. Sloterplas is an artificial pond in the western suburbs of Amsterdam. Sloterplas Lake was shaped in 1935 and it was part of the General Expansion Plan for the area. The lake presents a variety of activities in water sports. 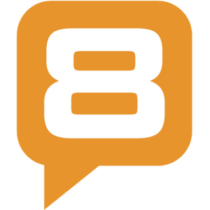 There are a great number of facilities for sailing, canoeing, angling, and diving sports. 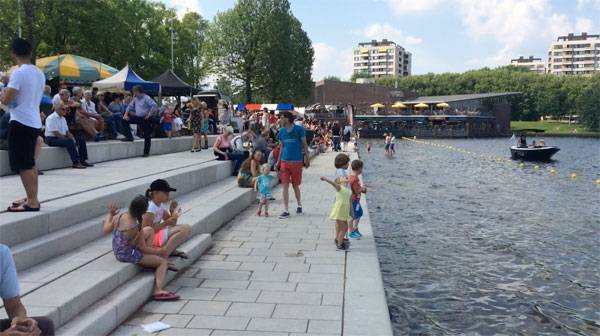 A new condition by the water was required to complete the experience and register the place as a new, interesting public area. 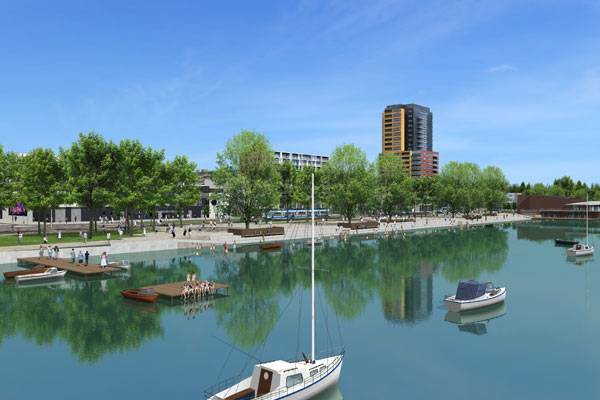 Gazing towards the water and being able to reach it are two principal qualities in most waterfront design projects. In the case of Zuidwestoever these qualities became the central point of the new plan. A new wide surface, paved with rectangular, grey stone slabs, forms a uniform base for the intervention. 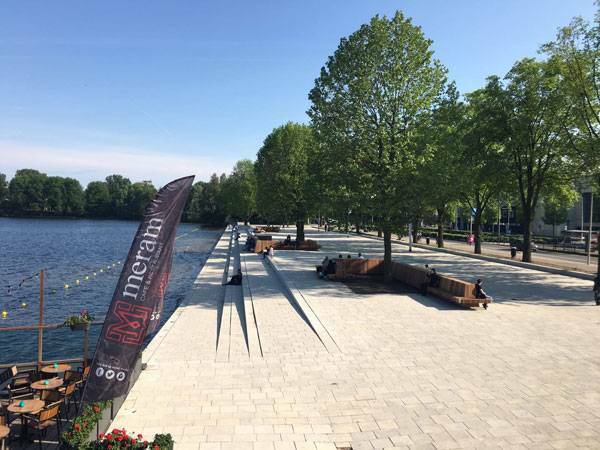 The paving ends along wide steps towards the water that allow both sitting and approaching the water’s edge. The steps connect the different topography levels and make the bank totally accessible in both longitudinal and transversal directions. 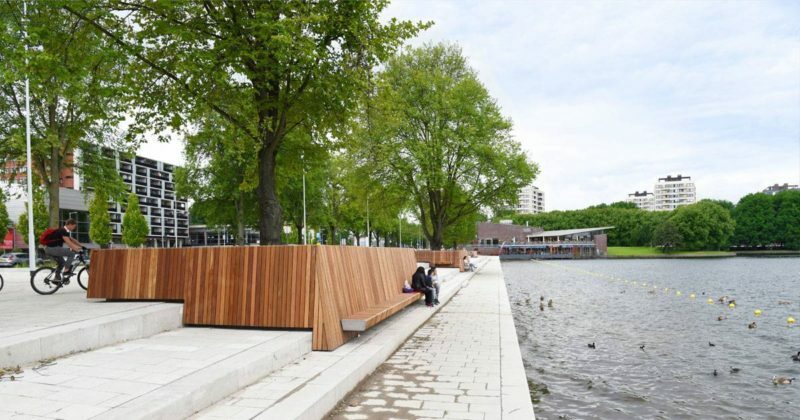 The existing trees near the lake that seem randomly planted are framed with wooden benches especially designed for the project. The seating units form a sort of puzzle around each tree trunk and create a sense of rhythm and interesting variations according to the water proximity. 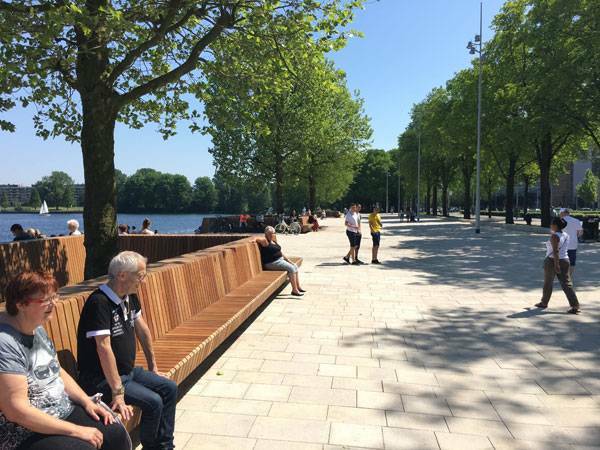 The bench design bears the signature of Grijsen Park & Straatdesign, a well-established company in the field of urban furniture and infrastructure. A row of existing trees creates a clear boundary between the intervention and the adjacent vehicular access. The rest of the surface is open to possibilities. 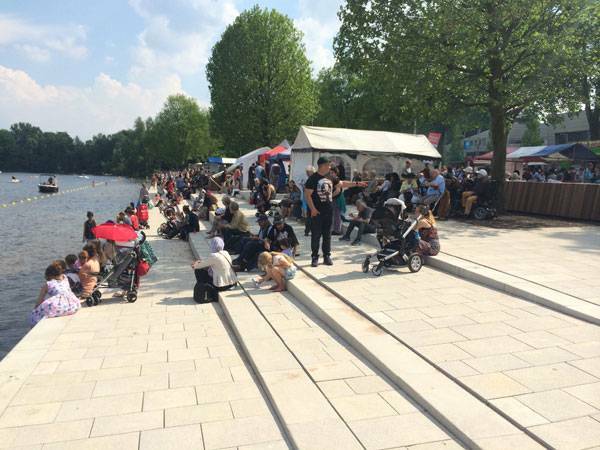 Walking, an open air market, musicians playing by the lake; anything finds its place there. 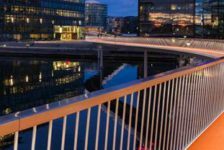 In most projects, urban equipment comes from a wide range of ready-made design products that sometimes fit more and sometimes fit less into the general concept. The Zuidwestoever project makes an exception; it places the main focus on urban equipment instead of anything else. The benches are custom-made and they are what actually materializes the project geometry. Seen from a certain angle, they seem like they are floating over the water, blurring the boundaries between land and lake. 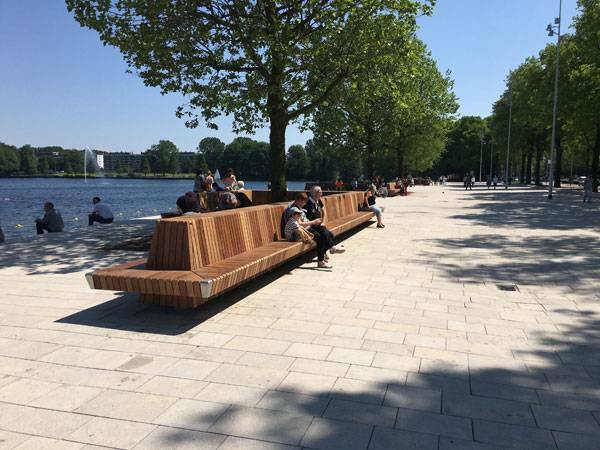 The benches were constructed in parts, brought onto the site, and then installed. That allowed for both transport and any necessary adjustments to take place easily. 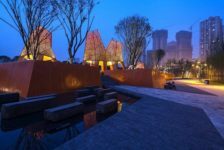 The wooden parts are specially treated in order to resist high humidity and being exposed to difficult weather conditions. They maintain their quality and texture with little maintenance. Special LED lighting fixtures create a unique atmosphere and make the area accessible and interesting during the night. 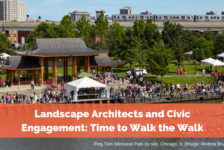 Landscape interventions are about the large scale. There is no doubt about that. Anyone working with the landscape does not do it because they get excited with 1-to-5 scale details. 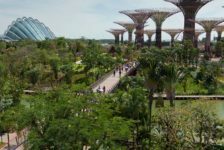 However, addressing the actual issues that a project presents might also involve handling smaller scale, especially when it comes to urban design projects. Sometimes it is important to take the design process to an extravagant level of detail in order to reach a successful result. This is what this project has to contribute; a way of thinking towards detail and urban equipment that is different and subversive. Urban equipment becomes a concept itself, a design tool that actually articulates the intervention.